A handy "How-To-Build-Your-Own" booklet complete with photos. 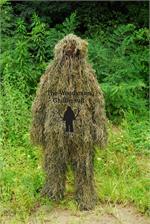 This is the same information on our "How to Build a Suit" section, PLUS, includes an additional booklet on how to Build a Ghillie suit on too BDU's with materials found in local stores in your area. Instead of receiving a Mailed version, This is a PDF file you download. There are 5 total files. These FIVE (5) files will be compressed in a Zipped format. You will need a program like PkZip to open the files. You can get a trial version at www.pkzip.com This file is 3.90 mb. Full Instructions included on how to assemble this product!